Understand the probability scale from 0 to 1, including that a probability of 0 means impossible and a probability of 1 means a certainty. Describe an outcome in terms of likelihood using words. Place an outcome on a probability line between 0 and 1. Calculate the theoretical probability of an outcome for a simple event involving a single experiment with equally likely outcomes. Use an experiment to calculate the relative frequency of an event, and compare this relative frequency to a prediction made using theoretical probability methods, including an understanding that one would not expect the relative frequency to be exactly that predicted by theoretical probability. Calculate the probability of NOT getting an outcome (complementary outcomes). 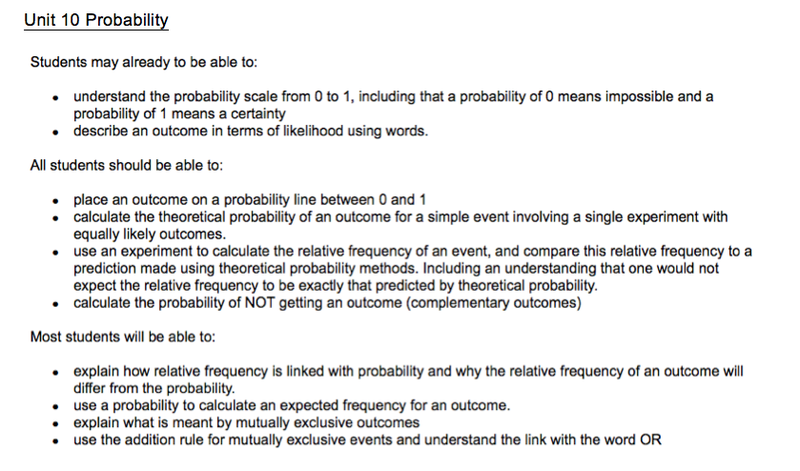 Use a probability to calculate an expected frequency for an outcome. Explain what is meant by mutually exclusive outcomes.